CBSE Class X, XII exams Results of Class 10, 12 Board Exams 2018: CBSE admit card for board exams 2018, CBSE Class X, XII exams Admit Cards for Class 10, 12 Board Exams 2018. The Central Board of Secondary Education (CBSE) 2018 examination for Class X and XII will begin on March 9. While a total of 16.67 lakh candidates from across 16,354 schools will appear for the Class X examinations, around 10.98 lakh candidates from 10,677 schools across the country will appear for the Class XII examinations. While the Class X exams will end on April 10, the Class XII exams will end on April 29. The results would be declared on time as the Board has adopted several Information Technology (IT) initiatives which will aid in faster result processing. The Central Board of Secondary Education (CBSE) has released the admit card of candidates for Class 10 and Class 12 board examinations 2018 on its official website. The candidates can download the admit cards from the official website ~ cbse.nic.in. Students must carry their admit card to the examination centre. The Class 10 and 12 board exams will begin as per its schedule. More students have opted for Class 10 board examinations to be conducted by the CBSE over school-based examinations. There is an increase of over a lakh in the number of students compared to last year when the difference between school and board exams was over 24,000 though more students had opted for board even then. Around 16.67 lakh students will appear for board exams which would end on April 10 and April 29 for Class 10 and Class 12, CBSE is confident of releasing the results on time. The exams usually begin on March 1, and results are declared in the third week of May. 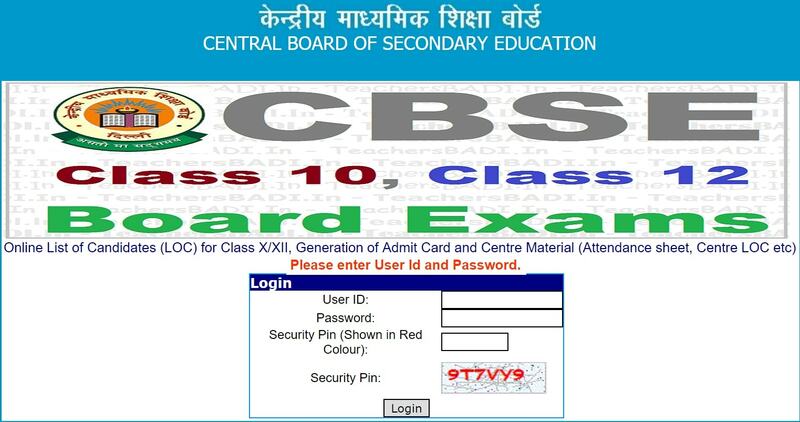 CBSE Class 10th and Class 12th Exam Admit Cards 2018 have been released today by the Central Board of Secondary Education (CBSE) on its official website - cbse.nic.in. Regular as well as Private candidates’ Admit Cards are available online. CBSE Board Exams 2018 for Class 10th and Class 12th are slated to begin on 5th March 2018 and students can access important information like details of their Examination Centre, Roll Number and important instructions from the Admit Cards. Candidates must carry their Admit Card on the exam day for hassle free admission in the examination hall. The Central Board of Secondary Education, CBSE is to release the admit cards or roll numbers for class 10th and 12th board examinations. The admit card or roll numbers are expected to release and be available from the first week of February 2018. The CBSE Board examinations 2018 are starting from March 5, 2018. The center details along with the roll number would be provided on the admit cards, without which admission to the examination hall would not be permitted. Here is how and where students would get their roll numbers. Please note, for regular students or students enrolled in CBSE affiliated schools would have to get the admit cards or roll numbers from their respective schools/ institutes. The admit cards are uploaded and the school authorities are charged with handing out the physical admit card or roll number to the students. As for the private candidates, the facility to download the admit card would be made available on the official website cbse.nic.in. CBSE would be conducting the board examinations for class X and XII from March 5, 2018. As reported, nearly 10 lakh candidates have enrolled for the CBSE Class XII Board examination 2018 while about 18 lakh students have enrolled for the CBSE Class X Board examination 2018. The board has not released any new policy regarding moderation and is maintaining its stance. Practicals for class 12th examinations are already under process and would end by February 25, 2018. The roll numbers are expected to be made available in first week of February for both regular and private candidates. Central Board of Secondary Education (CBSE) is likely to release the results of Class 12th examination next week. Many media reports are claiming that the result might be out on May 21, considering previous year’s release date was same, however, there is no official confirmation by the Board yet. Though this year, the CBSE exams were postponed due to Assembly Elections held in five states, however the Board will declare the results on time to avoid any delay in admissions for various undergraduate courses in the universities. CBSE Class 12 results are expected to release by May 24. Since over 10.28 lakh students will be checking their results at the same time, it is better for the students to keep an eye on all options. Like previous years, the Central Board of Secondary Education (CBSE) will release the results with the technical support of National Informatics Centre (NIC), Department of Information Technology, Ministry of Communications and Information Technology. Also, students can get their results on the telephone numbers of NIC and MTNL through which results can be accessed through IVRS. The schools will automatically get their entire results on their email ids which are registered with the Board. Students can also call on the telephone numbers of NIC and MTNL through which results can be accessed through IVRS. These are the National Informatics Centre: 011 – 24300699 and the MTNL: 011 -28127030. Last year, to make Class 10 and 12 exam results access easier, tech-giant Microsoft had collaborated with CBSE on its search engine, Bing.com. The students, parents and teachers can easily search and get the scorecards on mobile, PC and tablets as well. Also many private websites like examresults.net, indiaresults.com also host the results.